This weeks Monday Motivational Poster on Growth Mindset The smartest people are those who never stop trying is a big one. It is so important to help our kids to use a growth mindset. We can teach them that smart people are really only smart because they never give up. They keep on trying and trying. If one way doesn’t work then it is time to find another way. All things are possible with time, help, patience, and of course using our brain to figure it out. Often times our kids can get stuck on a problem or they have difficulty figuring it all out. Sometimes it is a very real struggle and other times it can be just a preconceived notion they have about a subject. How many times have we heard “I am not good at …..(fill in the blank).” Some children tend to get frustrated very easily and just give up and walk away. There are so many things in life that are hard it is part of our job to help students realize that once they hit that wall, it is not time to give up at all. It may be time to take a break, get a new perspective and then get right back at it. That is why I LOVE this week’s book suggestion. 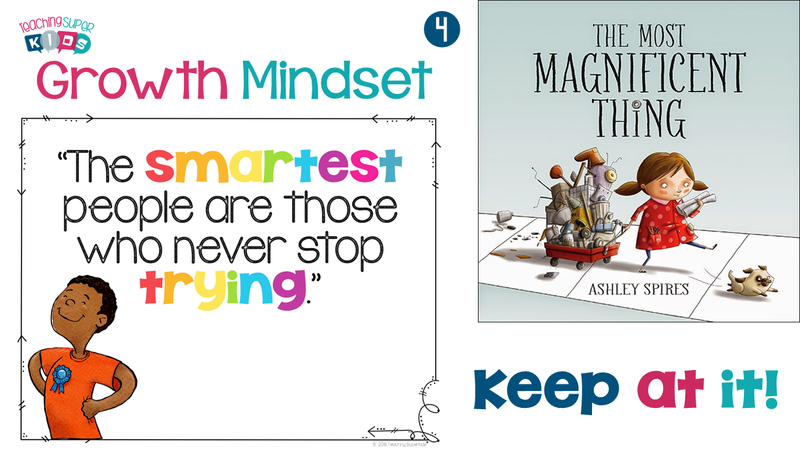 The Most Magnificent Thing by Ashley Spires is a great Growth Mindset book to have in your library. It is all about a little girl who has a fantastic idea. She decides to make the most magnificent thing! She has made things before so she has an idea that it will be easy. She knows everything about it and gets to work on it only to find out that it is harder than she thought it would be. The little girl keeps trying but everything she does isn’t working. Her trusty sidekick; her dog gets her to take a break and go for a walk and when she does she gets a new perspective on it. She comes back to work on her most MAGNIFICENT thing and finally gets it right! She keeps at it and does give up! I really encourage you to get this book and add it to your class library it is one you will be able to share each and every year to encourage your students to keep trying and they too will be able to succeed. Click on the image below to download this weeks Growth Mindset poster on the Smartest People!